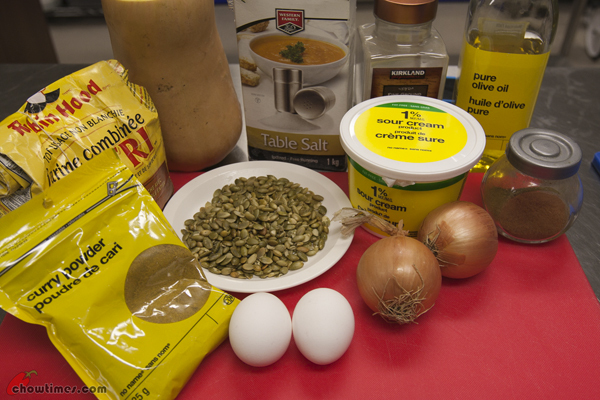 In the South Arm Multicultural Community Kitchen, Minoo shared three recipes featuring squash and green tomatoes. The recipes were inspired by the squash and green tomatoes given by Richmond Sharing Farm from their abundant harvest. The above are the squash given by the Richmond Sharing Farm. From front row, left to right is kabocha, sugar pumpkin and acorn. 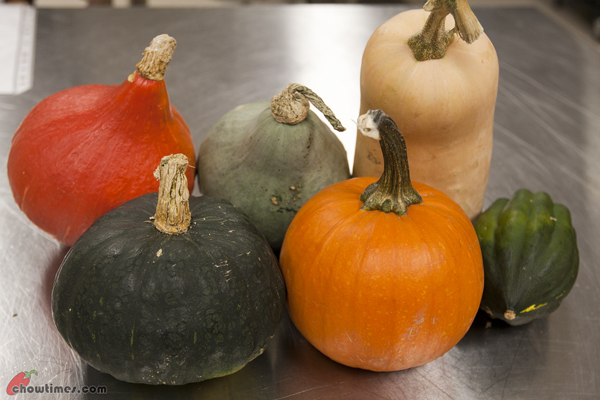 The one on second row right most is butternut squash and the one on the left most is red kuri squash. Any one know what is the name of the squash in the middle of second row? We made Butternut Squash Cakes with the butternut squash. 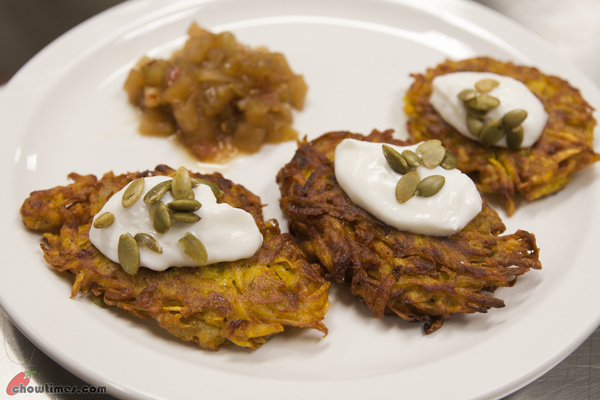 It is like latkes with the squash replacing the potatoes. They are crispy when freshly fried. These make a great lunch box item. 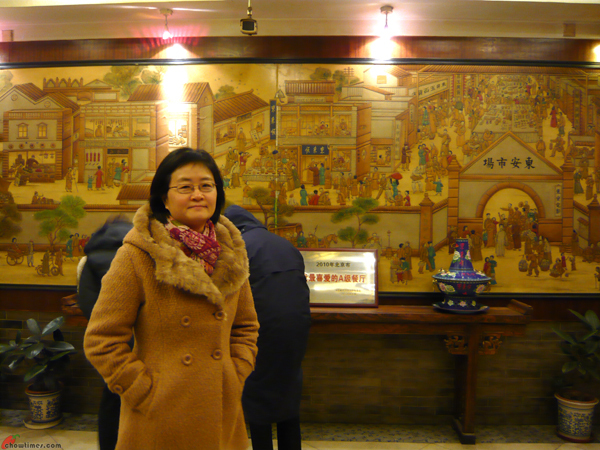 My last day in Beijing. We did a little shopping at a electronics shopping mall to get a USB stick so that I can bring the photos home. Ben also brought me to Walmart to do some browsing. We had lunch at a restaurant near the apartment hotel that Ben stayed. This restaurant serves some homey dishes as the name suggests. We had a cold octopus appetizer. It was sweetish and pretty good. When the weather is good, Ben likes to explore new walking path. 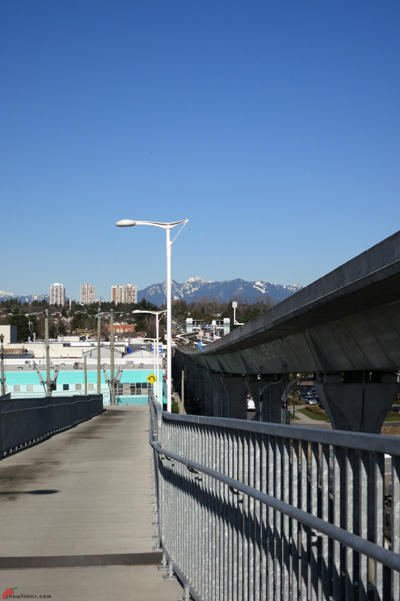 During a spring/summer day, we decided to walk across the Canada Line bridge from Richmond crossing over to Vancouver. 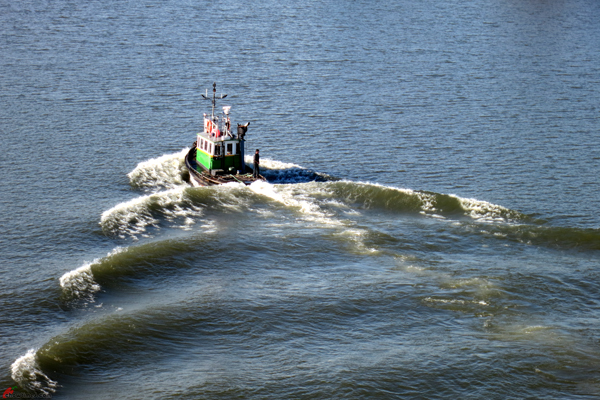 Fraser River view from the bridge. 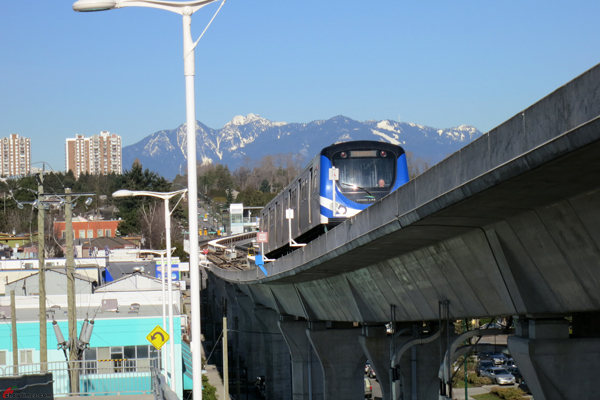 View of the north shore mountains from the bridge. It was a cold windy day. 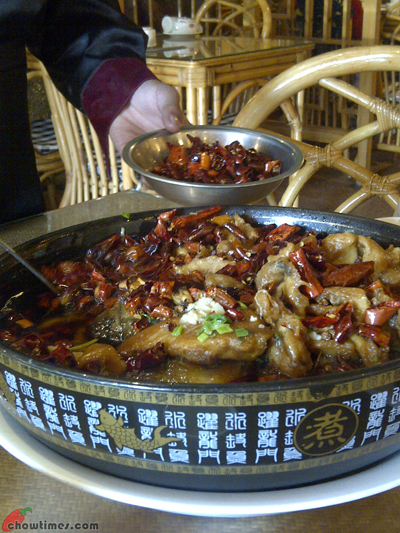 What is better than a hot pot meal? Ben brought me to a Dong Lai Shun Muslim Restaurant for dinner. 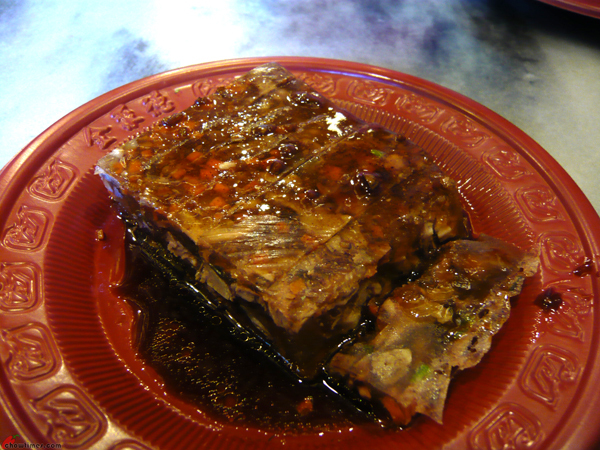 Dong Lai Shun is one of Beijing’s oldest Hui, Chinese Muslim restaurants. 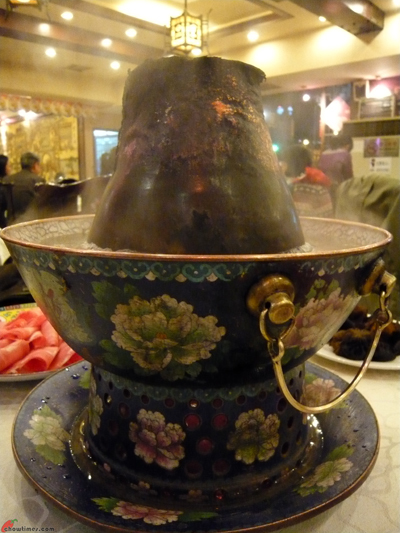 It is a hot pot chain. We waited for at least 30 minutes to get a table. It was full house. 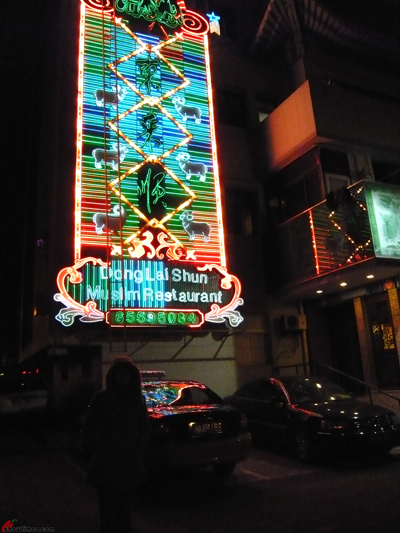 This is a popular restaurant; more so in cold nights. It was a windy and chilly day. We decided to go for an indoor activity to avoid the cold. 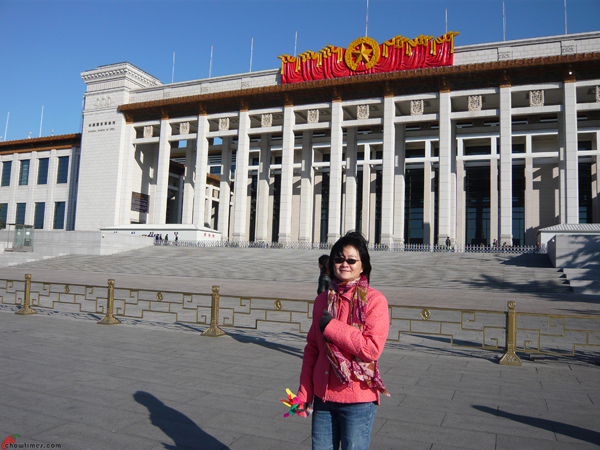 The National Museum of China was an apparent choice since it’s within walking distance from Qianmen Dajie. 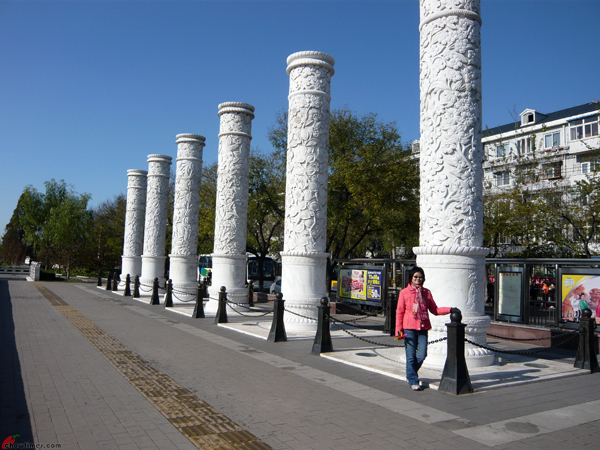 It is located on the eastern side of Tiananmen Square. The entrance to the museum is free. You can imagine the line as everyone was trying to get indoor. 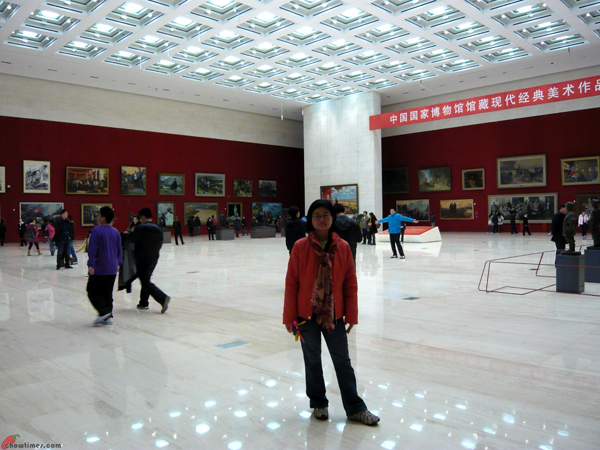 The National Museum of China is huge. It has a total floor space of 200,000 square meters for display. 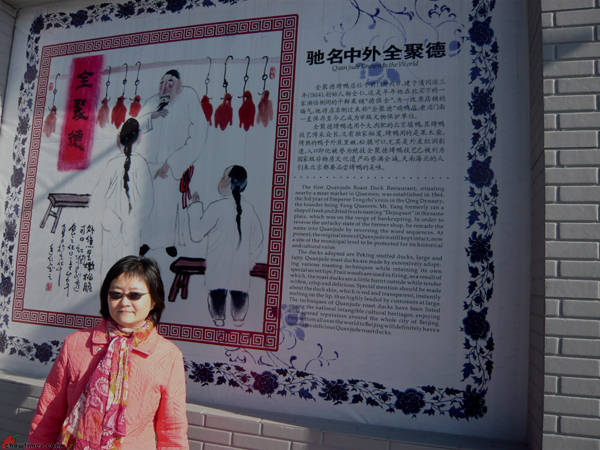 This museum was a merger of the Museum of the Chinese Revolution on the northern wing and the National Museum of Chinese History on the southern wing. 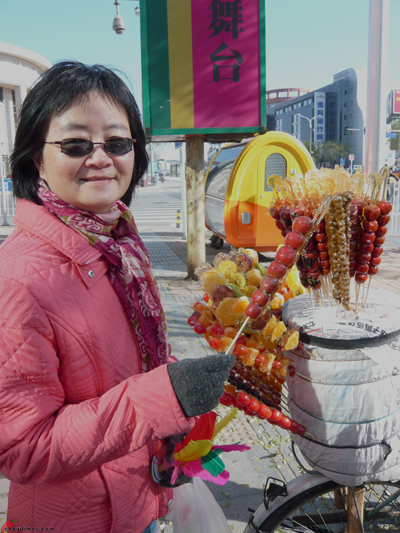 I got a stick of the sugar coated haw for snack before lunch. It was RMB2 (CAD0.35). The sourness of the haw whet up my appetite for lunch. 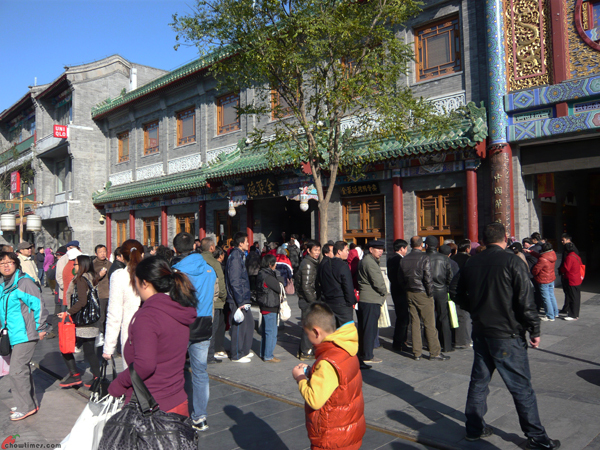 Qian Men DaJie is a touristy street lined with time honoured shops. 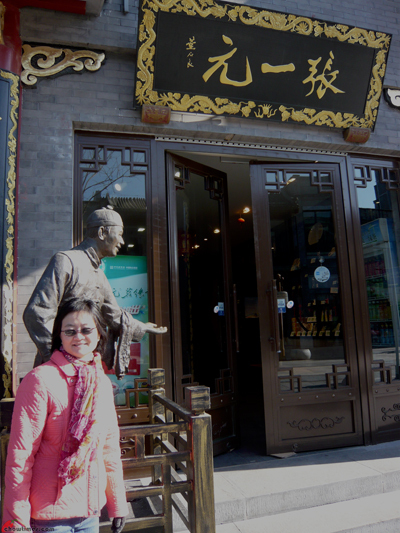 Quanjude is one of the time honoured shop in Qian Men Dajie. 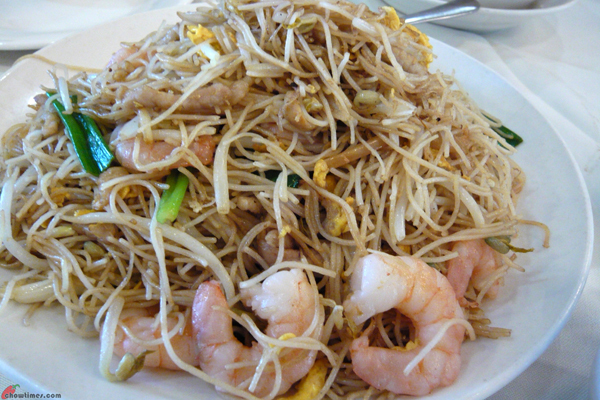 Quanjude has several locations but this is one of the most popular one due to it’s location. The above line shows it’s popularity. We waited for 30 minutes before we got a table. 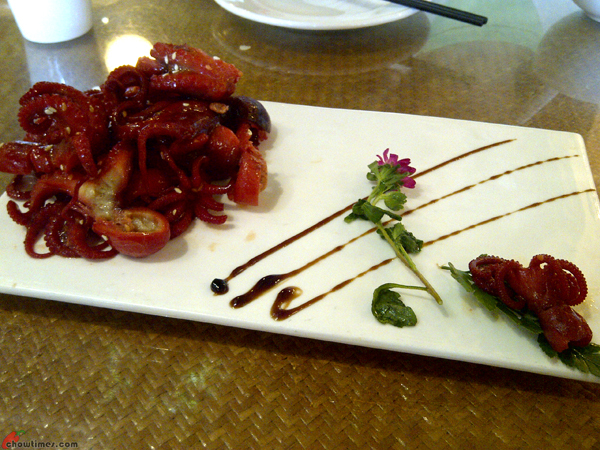 We opted for a combo for two for RMB270 (CAD45). 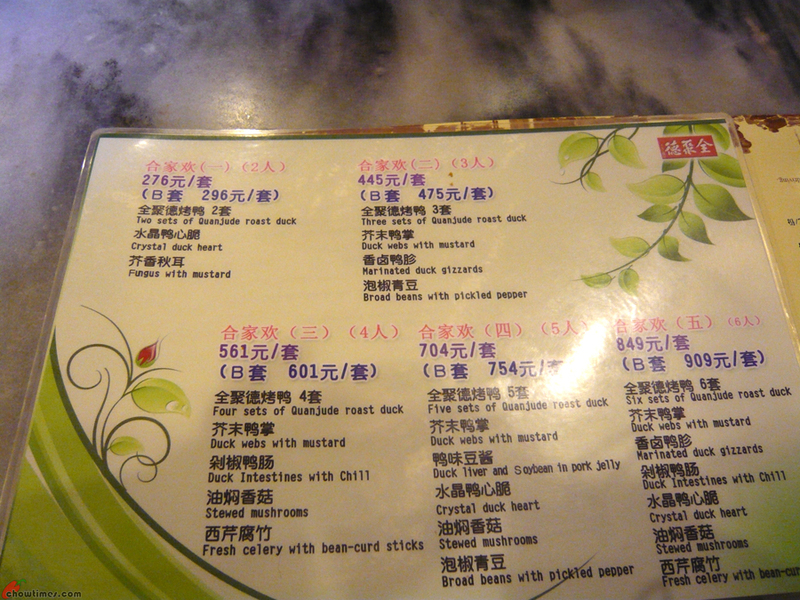 This is pricey in Beijing standard. 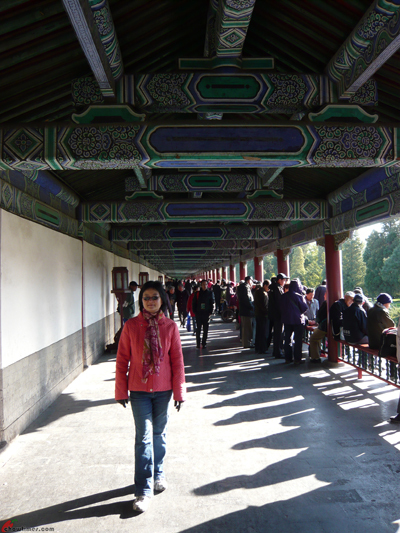 After the tour of the Temple of Heaven, we went to look for public transit. 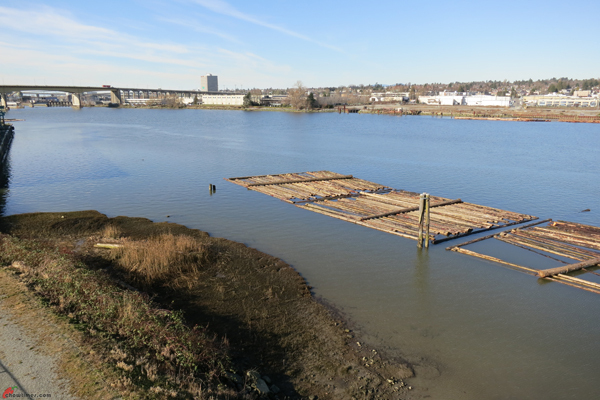 We came upon this beautiful walking path along a waterway. We enjoyed our walk along the flower bank. 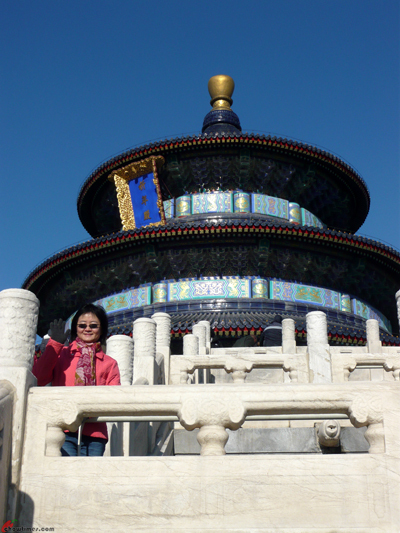 My last full day in Beijing is dedicated to the Temple of Heaven which is a complex of religious buildings at the southeastern part of central Beijing. 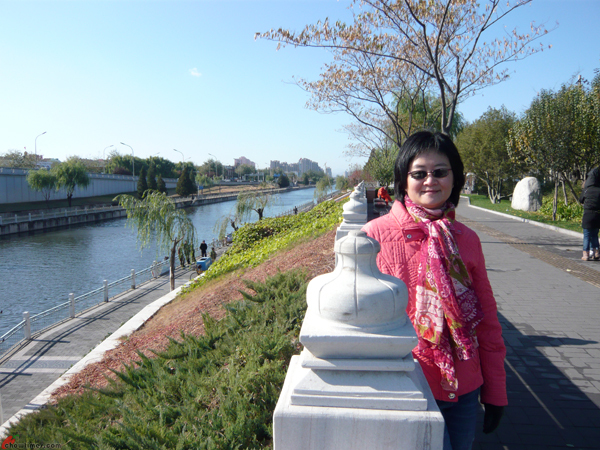 The complex occupies an area of 2.7 square km; larger than the Forbidden City. It was a place where the emperor (son of heaven) gave thanks to heaven and prayed for good harvest for the following year. 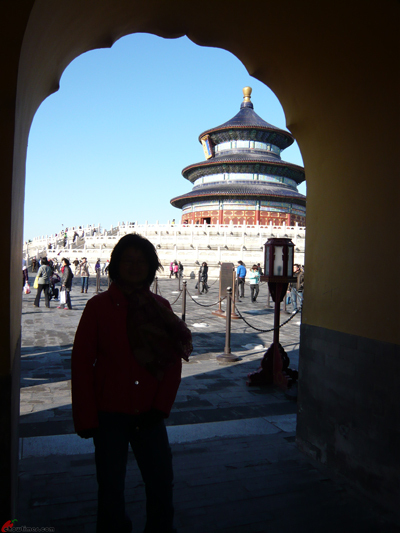 The Temple of Heaven was constructed from 1406 to 1420 during the Ming dynasty. 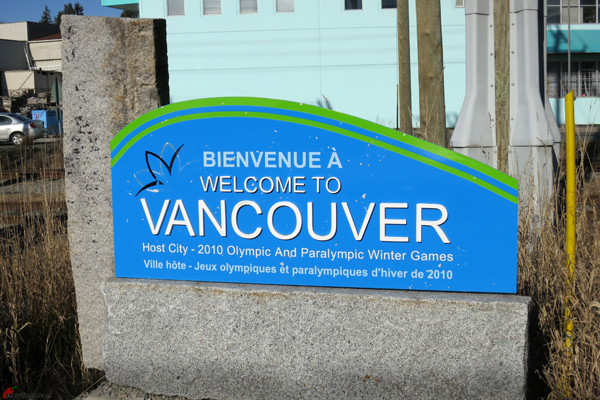 It was inscribed as a UNESCO Heritage site in 1988. The park is opened to public in 1918. It becomes a popular place for people to gather for singing, exercising, socializing and past times. A corridor like those found in palaces with a colour scheme of blue to represent heaven. The most recognizable building in the complex is the Hall of Prayer for Good Harvests. It is a circular building on a triple layered white marble terraces. This is where the emperor would offer sacrifice to the heaven on Winter Solstice. Emily, Lorna, Marian and I met up for lunch at HML in summer. The original plan was to meet at Northern Chinese Cuisine but unfortunately it is closed on Wednesday which we were not aware of. So, we changed our meeting place to HML . HML was busy even on a weekday. 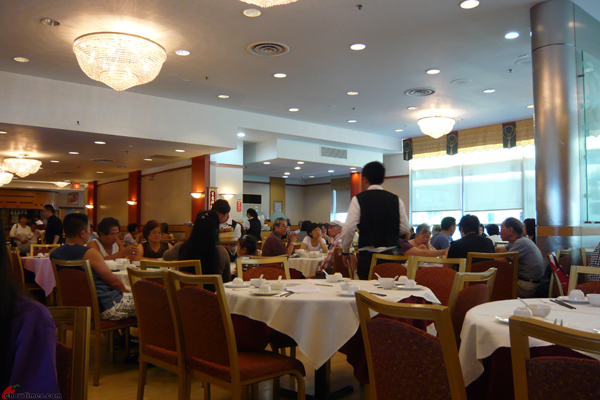 Tea is free here and there is a 20% off for all dim sum items every day. Emily and Lorna had ordered a few items as me and Marian were running late. 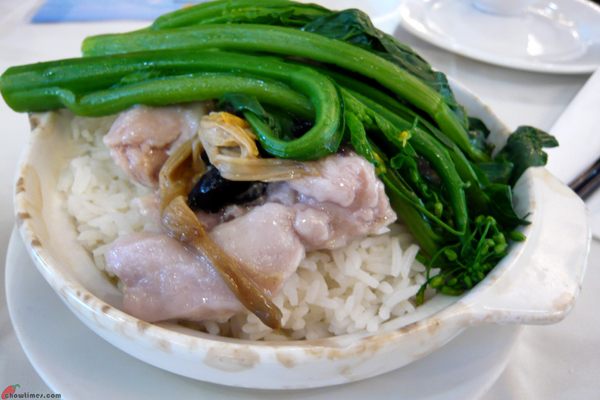 The first item was Steamed Rice with Chicken, Lily Flower and Fungus. This is $5.80. Lorna ordered a Fish Head and Tofu Hotpot. 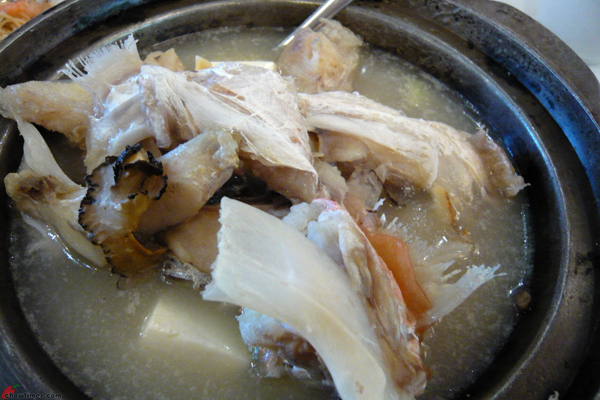 It is a herbal soup dish. This is $8.80. 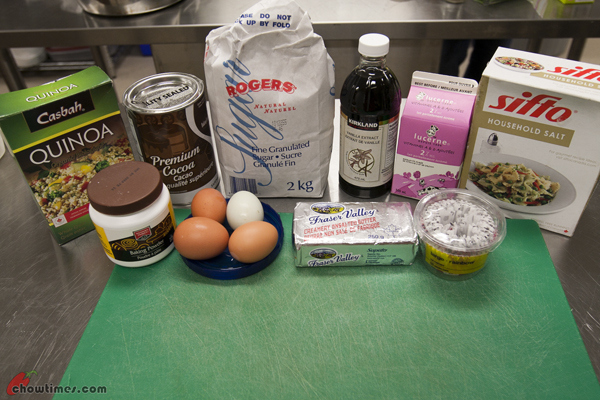 The last superfood featured in the South Arm Cooking Club for Seniors is Quinoa. 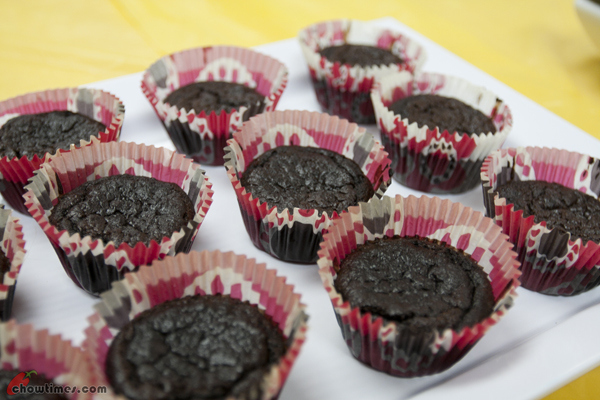 This Quinoa Chocolate Cup Cakes is made without flour; i.e. gluten free. This recipe makes an 8″ round cake or you can make them as cup cakes for easy portion control. We managed to get 30 cup cakes from this recipe.